Even though handing out valentines at school doesn't seem to be a common thing in Australia, I still make them for all the little bears classmates each year. I remember being so excited when I'd get a valentine as a child. Granted, every kid in class got the same mass produced paper notes with snoopy or some other cartoon character on them and they very rarely had a lolly attached, but it still made me feel special. Last year the bears gave out these DIY heart crayon valentines. Since my oldest started school very recently, I thought a photo valentine would be a good way to introduce her to her new classmates. For a quick how to, read on. Step 1: Using a photo editing site, design your valentine's card however you like. I used picmonkey which is a great free photo editing site. You can add text and graphics (I used hearts) to design your cards. Step 3: Cut out your valentines if needed. Then using an exacto knife, make a slit in the paper where you will insert the lollypop. The slit should be at the top and bottom of their hand so it looks like they're grasping the lollypop. Step 4: Carefully insert the lollypop, taking care not to rip the paper. 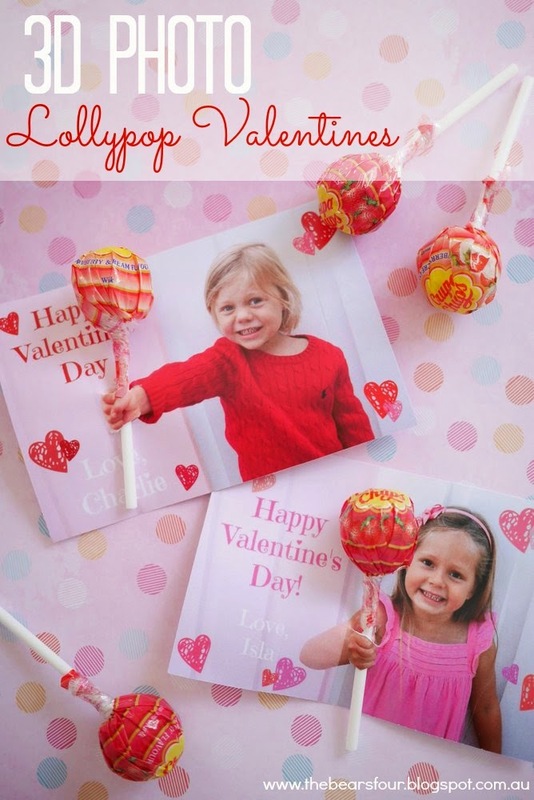 Super easy and adorable valentines.